Me: Rhiannon Giddens is a roots artist who plays banjo. Is that who you mean? Dad: What's a roots artist? So let's all be a little astounded by that and hope my dad didn't say something completely offensive to Ms. Giddens. I'm a little floored myself. Anyway, I dutifully pointed out that roots is cultural and it's based on African music. (My dad was at Newport Jazz Fest, by the way.) But this implicit assumption that folk and roots is somehow separate from the black experience is extremely problematic. Enter Ben Hunter and Joe Seamons' A Black and Tan Ball, an entry into what the duo call Black Americana. For the reasons outlined above, the band felt it important to draw this distinction. Their press material reads, "By pulling together the many threads of black American roots music, and demonstrating the underlying meanings behind the black experience in folk music, Ben Hunter & Joe Seamons are showing another side to Americana that can help expand the genre’s boundaries." 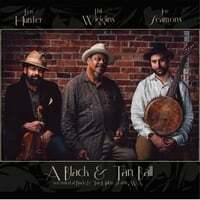 A Black and Tan Ball, Ben Hunter, Joe Seamons, and frequent collaborator and legendary harmonica player Phil Wiggins, is a far-reaching survey that incorporates blues, jazz and folk. But these aren't simply party songs; these are songs that tell tales of oppression and resistance just beneath the surface, songs that necessitate their own label. These renditions are beautiful and timeless. Hunter and Seamons know their stuff too -- you can check out their liner notes and listen to other versions of the songs here. Wiggins' harmonica is lush and organic. Hunter's voice is rich and devastatingly emotive. Seamons tears up all the rugs. The trio's rendition of "John Henry" is not to be missed. The sense of pride in their work and humility in the footsteps of their forebears throughout the album makes A Black and Tan Ball truly remarkable. Help support Adobe & Teardrops! Subscribe via Patreon or drop a one-time tip (no account necessary!) over at Ko-Fi!